The Stihl RT5112 Z Ride on Mower 110cm with a powerful 2-cylinder engine, large grass catcher box and wide (110 cm) cutting width, is perfectly designed for large lawns up to 8000m². Enjoy the sprung loaded seat which is adjustable to all heights and master the controls which are close at hand: the forward/reverse drive lever at the steering wheel, the central cutting height adjustment, the blade clutch and the lever for effortless emptying of the grass catcher box. The RT 5112 Z features a very powerful twin cylinder OHV engine for top level performance. 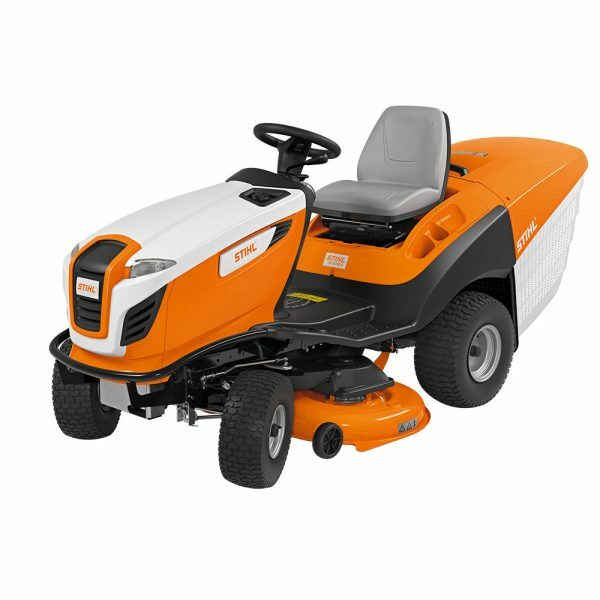 In addition the single-pedal operation and direct steering provide a previously unattained level of comfort during driving, manoeuvring and mowing. The Grass Guide System on both sides of the mowing deck catches grass blades at the edge of the deck and guides them towards the cutting blades. The sychronised blade system provides a neat and clean cutting pattern and class leading grass collection. The RT5112Z comes with a 5 year extended warranty (subject to registration and annual servicing). The polymer grass catcher box can be emptied effortlessly from the driver’s seat simply using the curved shaped handle. The “dumper” design ensures optimum filling and residual-free emptying of the grass catcher box. Cleaning the catcher box is also easy.